" I n s i d e N e p a l "
Arrive in Kathmandu any time, transfer to our hotel in Bhaktapur (this will be our base-camp for the first week). In the evening, we will meet and get to know each other, ensuring that the group will be together and ready to begin the following morning. 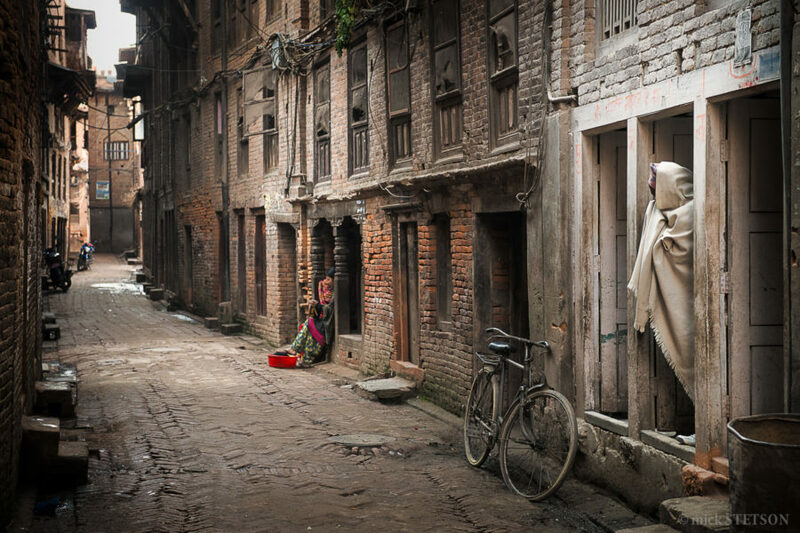 We will explore the ancient city of Bhaktapur (a UNESCO Universal Heritage site). The old city is mostly pedestrian with narrow, meandering alleys. 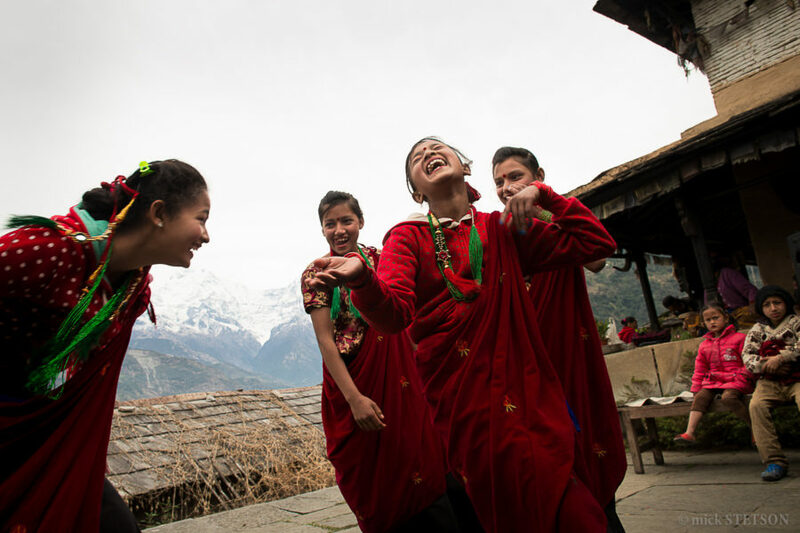 Day 2 coincides with the beginning of the Dashain Festival, a harvest festival dedicated to nine goddesses — the incarnations of the Hindu goddess, Parvati. In the morning & the evening there are colorful processions of people wearing their best clothes — accompanied by musicians — performing ritual baths and ceremonies at the Brahmani temples. During this time, 1 or 2 workshops will be conducted, depending on the group’s need or desire, using the festival as a subject for practicing the photography techniques learned in the workshops. At dawn, we will visit the Bodinath Stupa where devout Buddhist pilgrims bearing candles & incense circumambulate the sacred stupa in an holy pre-dawn procession. Surrounding Asia’s largest stupa are more than 50 Tibetan monasteries, supporting a large community of Tibetan Buddhists and making Bodinath the center of Tibetan culture in the Kathmandu Valley. 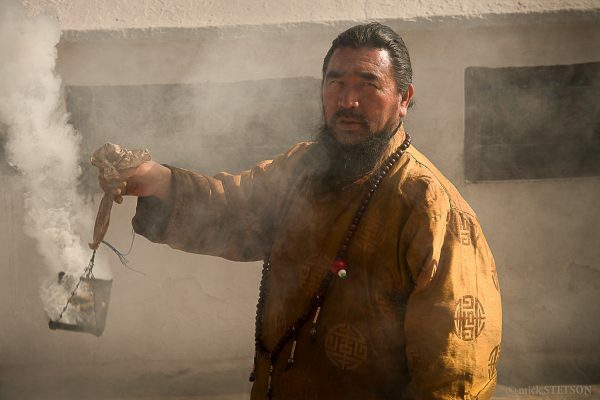 The surrounding narrow streets are bustling with monks with shaved heads and long maroon robes. Later, we will walk through the grounds of Pashupatinath, the most important sacred destination for Hindu pilgrims. 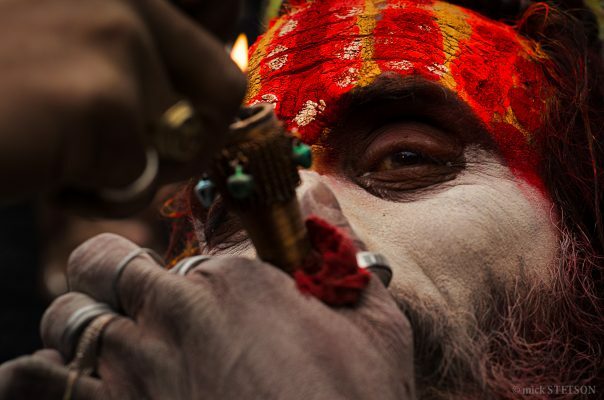 Sadhus and Hindu devotees from all over Nepal and India gather here to pray and worship the god, Shiva. There’s a colorful mixture of Sadhus and ascetics within the enclave of temples along the Bagmati River, as well as ghats for cremation ceremonies. 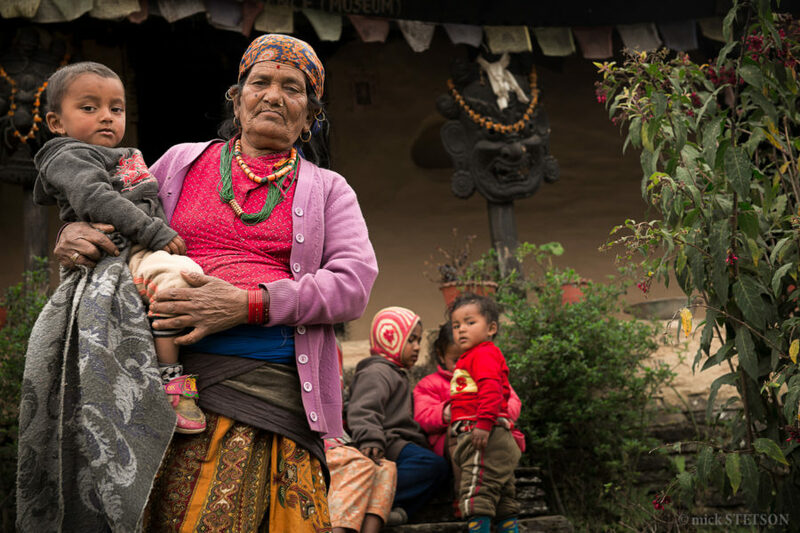 In the southern hills of the Kathmandu Valley, Dakshinkali is one of the most sacred sites for Hindu pilgrimages. The temple is dedicated to Parvati’s most bloodthirsty incarnation, Kali. As pilgrims bring goats, chickens, sheep and pigs to be sacrificed to the god, you will viscerally experience this visually exotic spiritual event. Dakshinkali reaches its climatic peak during the annual celebrations of the Dasain when it is flooded with a crimson tide of sacrificial blood. When a sacrifice is complete, the temple priests, who are also skilled butchers, prepare the carcass for the family to barbeque. The pilgrims, then spend the rest of the day in the forest barbequing and eating the feast, nothing is wasted. 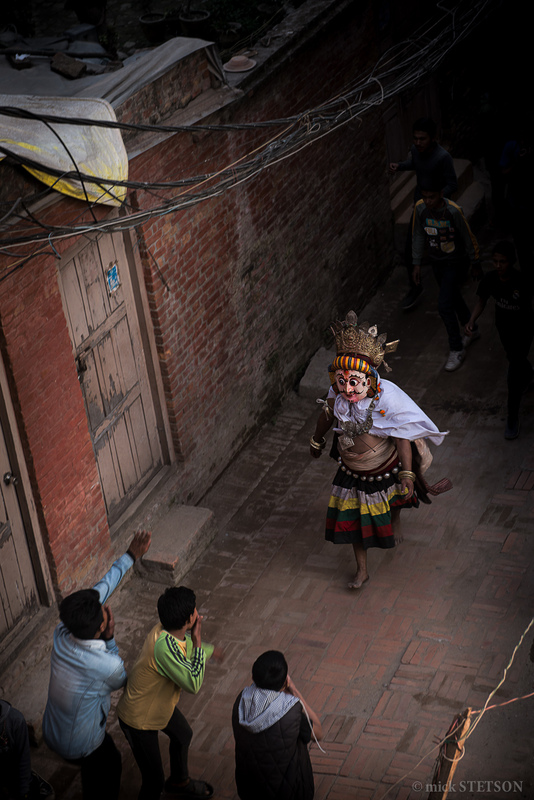 We will remain in Bhaktapur and participate in the main events of the Dasain Festival, including the Brahmani Temple rituals and the colorful processions of musicians and masked dancers retelling the battle and victory of Lord Rama over the evil demon-king, Ravana from the ancient Hindu epic, Ramayana. In the evening, enjoy a dinner and a slideshow of the group’s best images for the week. 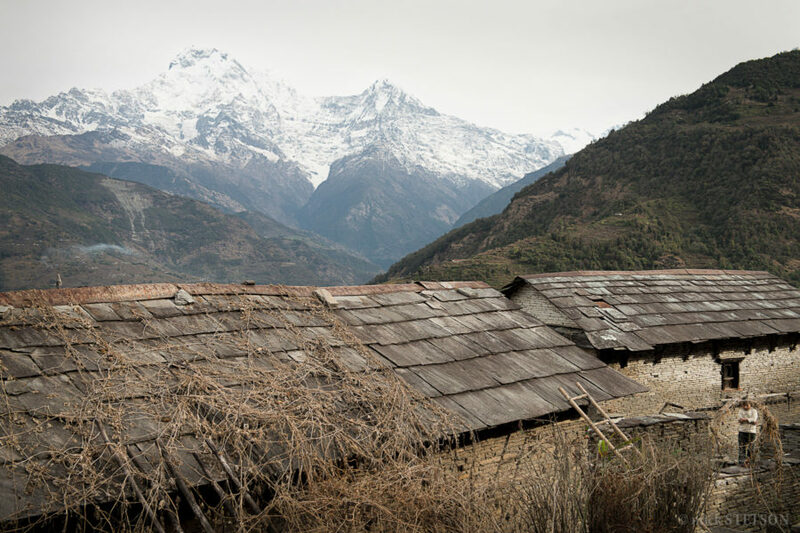 In the morning, we will travel to Pohkara along the Prithvi Highway where historic villages and ancient temples flank the valley road. Lunch will be provided either along the pristine, cascading water of the Trisuli River or in the ancient trade center of Bandipur (group members will decide). That evening we will arrive at our hotel in Pohkara where you will be free to explore the lakeside at your leisure for the evening and the entire next day until we meet in that evening (Day 8) for dinner and an overview of the next part of the journey. Transfer to our “homestay” in a beautiful village in the foothills of the Annapurna range. 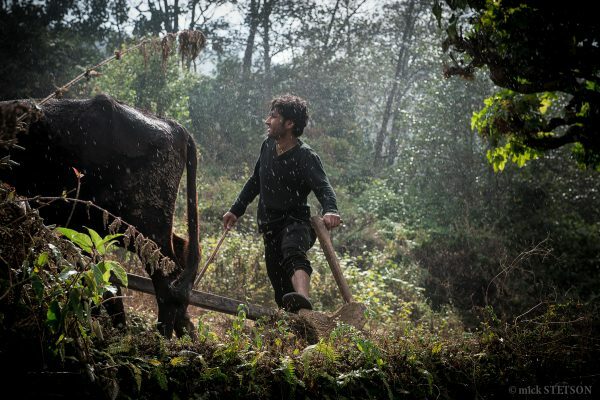 For the next 5 days, you will be immersed in the timeless scenes of village life in the Himalayan foothills. You will witness firsthand the authentic lives and work of villagers from the many small villages surrounding our base village. All meals will be prepared and provided by local residents. On one of the evenings, there will be a Nepali cultural performance that is typical of this region, and on another evening there will be a photography workshop that will teach you techniques/methods for producing memorable photographs of village life. Spend the morning exploring and photographing village life, then after lunch we will return to Pohkara. You will have the remaining part of the day to explore the lakeside. In the evening enjoy a “farewell” dinner and celebration. 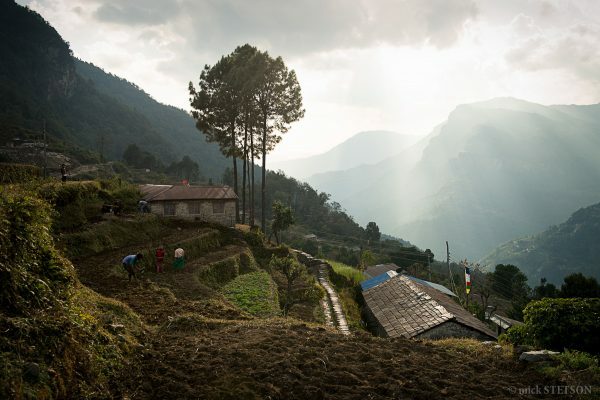 Return to Kathmandu and transfer to the airport for your flight home. Subscribe to our Newsletter to receive the latest news & information for our current and upcoming tours! 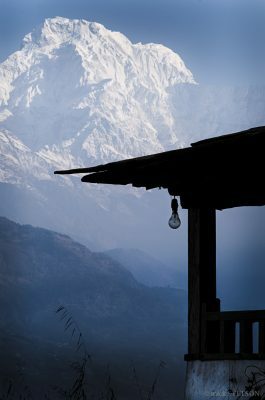 1) All accommodations; 2) All breakfasts during the tour & all meals during the Lumle homestay; ３) 3 dinners & 1 lunch (in transit to Pohkara); 4) Transportation from Kathmandu airport to Bhaktapur and back; 5) Bhaktapur historical city pass; 6) Overland transport for all travel during the tour, including Kathmandu to Pohkara and back; 7) A chartered minivan with driver (and lots of luggage space) to transport us safely and comfortably around the Kathmandu Valley & Pohkara for the entire trip; 8) A cultural tour guide throughout the tour to provide historical background information, enabling Mick to give full attention to the photographical needs and queries of the group.